"Louisville: The Home Of Bourbon. 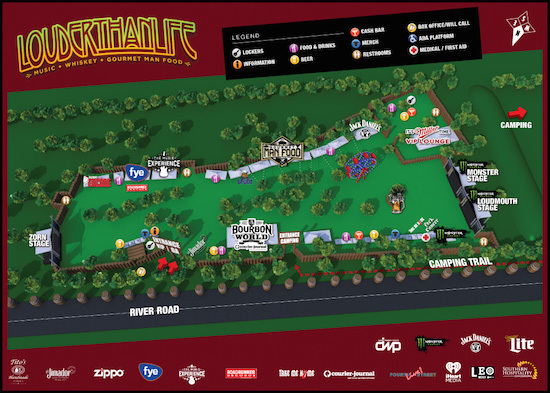 Band performance times and the official festival Pre-Party have been announced for the third annual LOUDER THAN LIFE, October 1 & 2, 2016 at Champions Park near downtown Louisville. The annual destination festival celebrates the region's culture and cuisine, and features award-winning bourbons and spirits, Gourmet Man Food, craft beer and some of the biggest names in rock music. 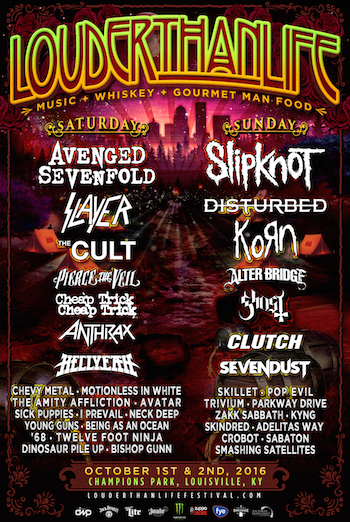 LOUDER THAN LIFE 2016 features Slipknot and Avenged Sevenfold—headlining together for the first time ever—topping a mindblowing music lineup of over 35 bands on three stages, with performances from Disturbed, Korn, Slayer, The Cult, Ghost, Rock and Roll Hall of Famers Cheap Trick, Pierce The Veil and many more. In addition, Fourth Street Live! will host official LOUDER THAN LIFE afterparties on Saturday, October 1 and Sunday, October 2, with nightly specials at Fourth Street Live! 's bars and restaurants throughout the weekend. Festival attendees are also invited to the Chef Edward Lee Dinner With Shannon Gunz at the Wine Studio at 610 Magnolia Restaurant. The dinner will be held Friday, September 30 at 7:00 PM, will feature a specially created menu by Louisville's very own celebrity chef Edward Lee, and will be hosted by SiriusXM's Shannon Gunz. Purchase tickets at: https://louderthanlife.frontgatetickets.com/event/qxgp2eidnhcb5iih. Produced by Danny Wimmer Presents, America's premier production company for rock music festivals, Louisville's LOUDER THAN LIFE features a selection of award-winning bourbons, whiskey, spirits, craft beer, and Gourmet Man Food curated personally by festival creator Danny Wimmer, along with a powerful music lineup of rock legends and breaking talent. The festival celebrates the bourbon culture and culinary heritage of this unique American city. In 2015, Louisville was #2 on the USA Today list of Best Local Food Scenes and was featured in Time Magazine's list of America's Best Music Scenes. Sponsors for LOUDER THAN LIFE include Monster Energy, Jack Daniel's, Miller Lite, f.y.e., The Music Experience, Zippo Encore, Tito's Vodka, El Jimador Tequila, 4th Street Live, Louisville Courier Journal, Leo Weekly, Spudz Potato Chips, Vibes High-Fidelity Earplugs, Roadrunner Records, Fxck Cancer's Dyin 2 Live, Marine's, Take Me Home Animal Rescue, Yelp and more.